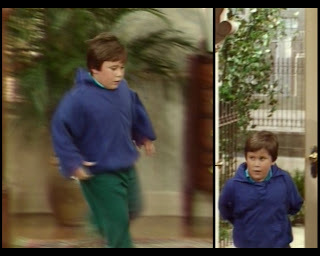 To kick off the third season, the family deals with a major crisis: there's a snake in the basement. That's really the only plot! 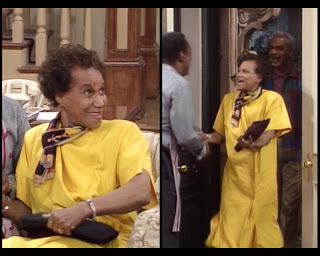 Cliff and Theo unsuccessfully try to catch it, then an exterminator is similarly thwarted, and then in a triumph over her massive phobia, Clair (with her husband's help) manages to scoop it up in a pillowcase. Order is restored. 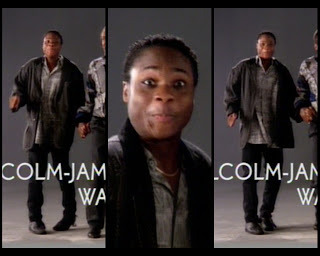 All of the action takes place over a single day, so only one outfit per character, but the story features several guest stars to help pad out this entry's length. Snake in the basement: ain't nobody got time for that. 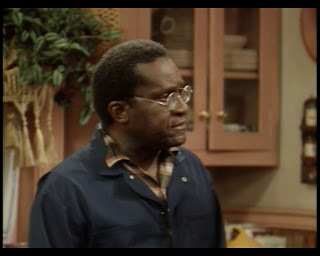 Leonard Jackson appears as the aforementioned exterminator. Just previously, he had played Pa Harris in The Color Purple. His resume extends to 1997's Conspiracy Theory, with recognizable movie and TV appearances throughout. Here, he's wearing coveralls and a work shirt, like you would if you were an exterminator. The round glasses give him a professorial air that's sort of at odds with his character, but some people wear glasses, you know? That's just how life is. If you want to keep him plump, you probably shouldn't have him run so much. Peter drops by only briefly, repeating his trademark running-out-the-door bit. It's not as cute as it once was. He's growing out of his roundness, though his costuming is trying to maximize his proportions in the right ways to compensate. 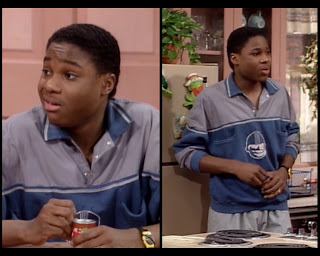 I love his crush on Denise. Mostly because it makes a ton of sense. Cockroach swings by the house in a pretty rad jacket. The '50s-inspired cut paired with that totally '80s finish on the rich burgundy fabric is wonderful. The blue detailing is a bold choice, but it works. 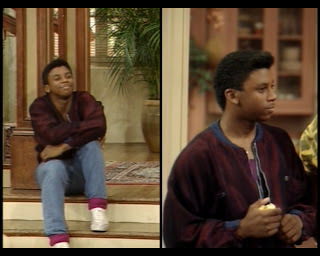 I probably couldn't pull off a coat like that, but I'd want to be friends with someone who could. Underneath, he's wisely chosen a simple purple tee that won't distract from the main event. The jeans he's picked are solid, but his signature puffy sock rolls are ruining everything, and he should really stop that. Range of emotion: she has it. Rudy is getting to that age where I'm going to have to review all of her stuff, even though she's still totally a kid. It just seems wrong to give her only inconsistent attention. 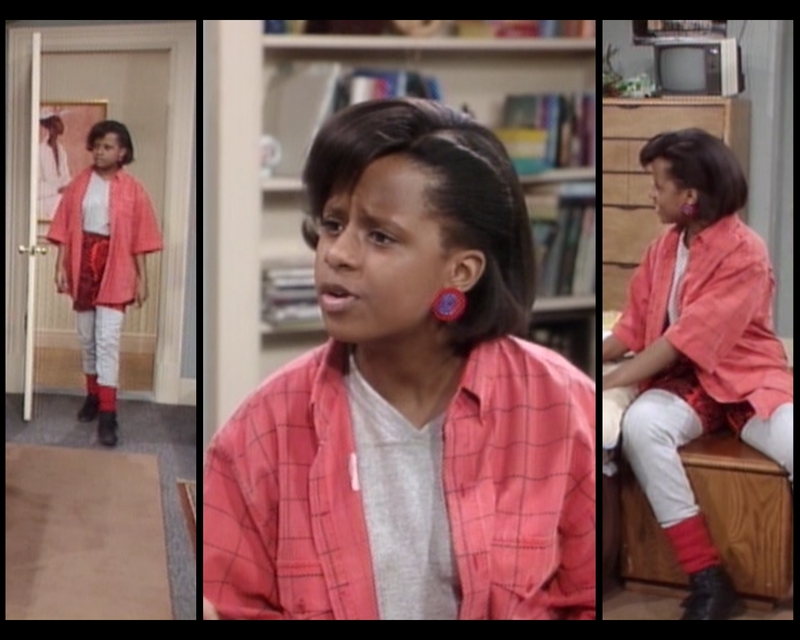 She's going for a matched set here, which is difficult when you're young and wearing something patterned, because you end up looking like you're still in your pajamas, even when you're wearing sneakers on the couch. Honestly why oh why does no one stop that madness?! As for palette, she could have done better. The periwinkle of her turtleneck, also seen in the print on her top and pants, doesn't go particularly well with the midnight tone, which itself is a little dark and severe. I like the brighter colors. She's youthful, and this outfit should thus be vibrant. Even when patterned, such a deep hue lacks the pop I want to see from her. A hard-fought battle, and yet still a loss. You know, Vanessa's a persistent worker, I'll give her that. She might not have style, but she's compensating with sheer force of will. For the top half, she's going for another away-from-the-body blouse that's sort of becoming her signature. I'm getting used to it in a way that's more about acceptance than enjoyment, but I'll take it. The pattern is good and the colors are even better. On the other hand, everything below the waist is a wreck in my eyes. Though dangerously close, the skirt doesn't actually match the leggings (which are blighted with an awful polka dot overlay, by the by). Beyond the color, it's the proportions that really bother me here: pants that stop at the knee with a too-wide skirt ending mid-thigh? No. She hasn't really hit her groove yet, but hopefully with continued observation she'll grow into her ambitions. I think his top might give a pictorial retelling of the plot of Star Wars. 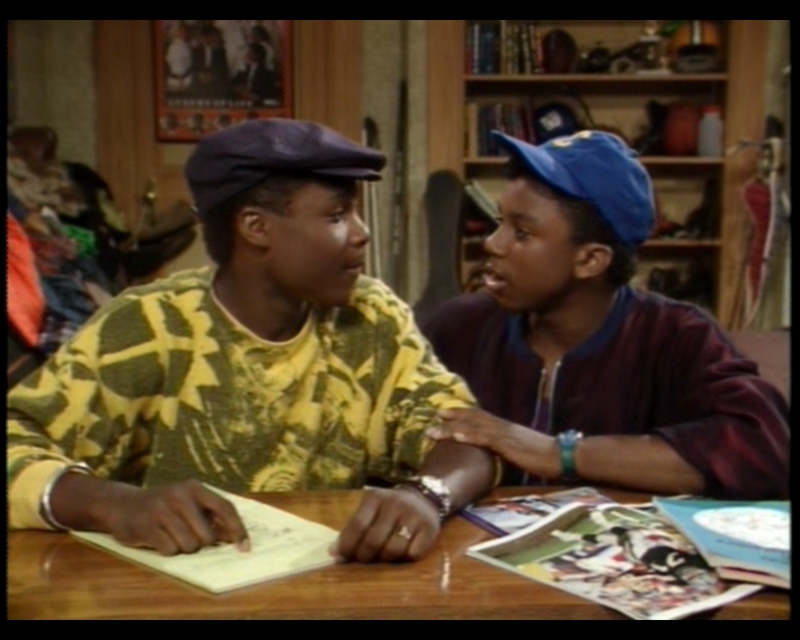 Later in the episode, he and Cockroach experiment with hats. As my eighth grade chemistry teacher taught me about science experiments: sometimes "no result" is your result. Those have to be extensions, right? She can't have grown all this over a summer. 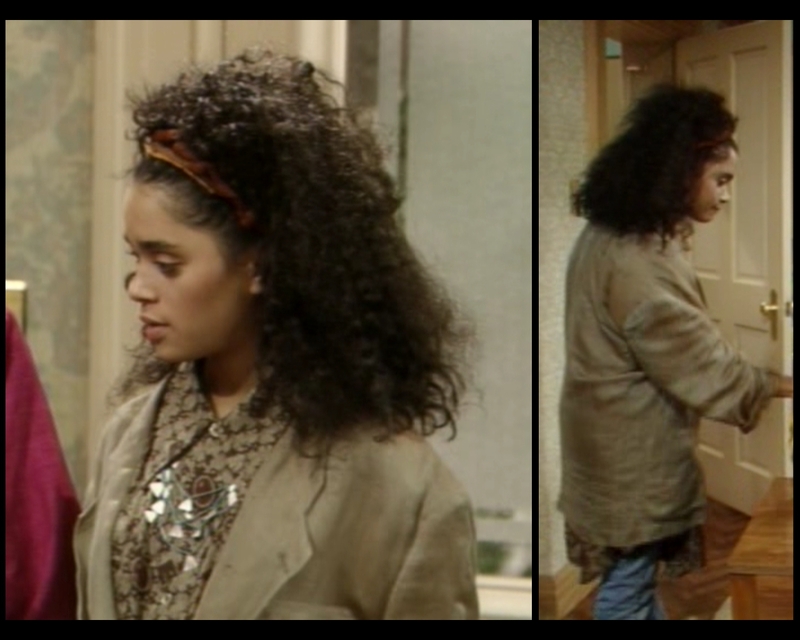 Look at how much hair Denise has. It's an intense situation. Don't get me wrong, I love every last strand of it, I'm just captivated by how much of each image is taken up by her coif. It's amazing. Less amazing is that coat, which drives the oversized concept into bolder, worse places. I can't tell if it's iridescent or dirty, but either way it's not a great shade (and the idea of an opalescent beige is just absurd). Disregarding that, she's doing better with the shirt and necklace. They're not obvious bedfellows stylistically, but work well together anyway; something in the blouse's pattern reflects the shape of the jewelry in a way that makes them link almost organically. That fringe of fabric jutting out from under the blazer gives me pause because I lack a basic comprehension of its origin. Does it imply a willowy skirt? Is it part of the jacket? Might it actually connect directly to her top somehow? 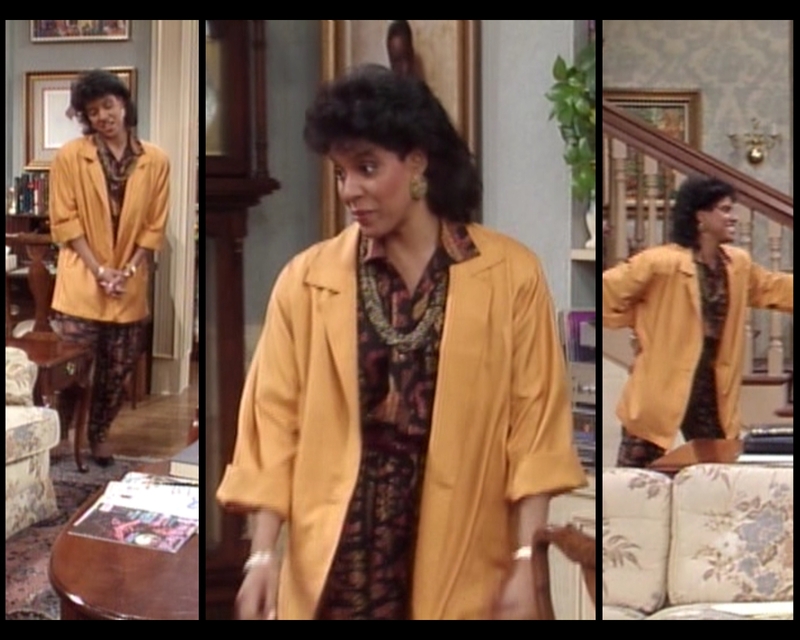 I'll add it to our mounting list of Huxtable fashion mysteries. 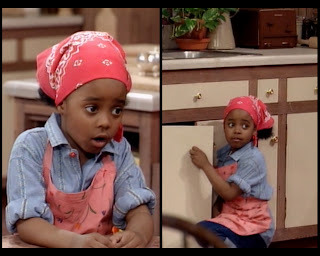 One day, in a spin-off reality show, me and Raven-Symoné will go searching for answers. Why would you ever buy that particular apron? 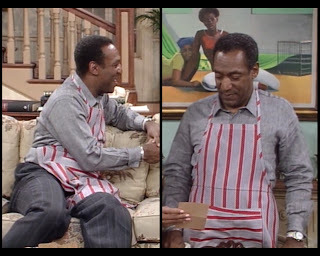 With the exception of the closing moments, in which he wears pajamas, Cliff spends the entire episode in this goofy apron. 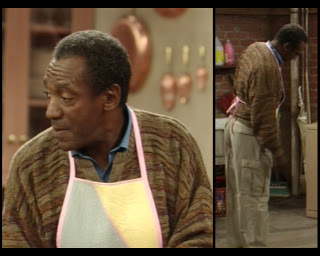 He's also wearing his raggediest sweater. Its mildewy shades and droopy cut have a sense of resignation about them. If a garment could voice regret about its choices, this one certainly would. He brightens it up a little with that nice shot of blue in the collar, and he's back in the cargo pants game to show us that he can keep current, but there's really nothing that can be done to revive this woolen cornucopia of woe. I've never seen such a depressed, depressing article of clothing. 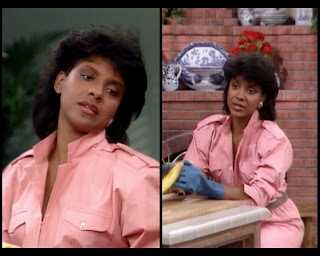 Starting this week and continuing until the end of season three, I'll end each entry with a new segment: HOW ARE THEY HIDING PHYLICIA'S PREGNANCY THIS WEEK? Pay no attention to the fetus behind the curtain. With a giant box! Also, with many layers. The color itself is dynamite on her, but it's going to be tough for me to do any sort of meaningful critique of her choices because much of her costuming is based in practicality rather than fashion. Sure, they want her to look good, but it's also important that the viewing audience be tricked into overlooking her increasingly obvious biological state. 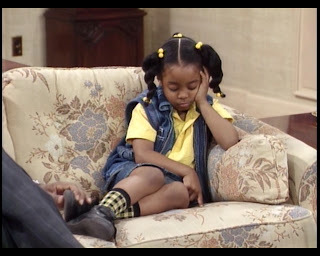 To be fair, the show actually references her expectant nature slyly in the script, with Clair asking Cliff if she has gained weight. 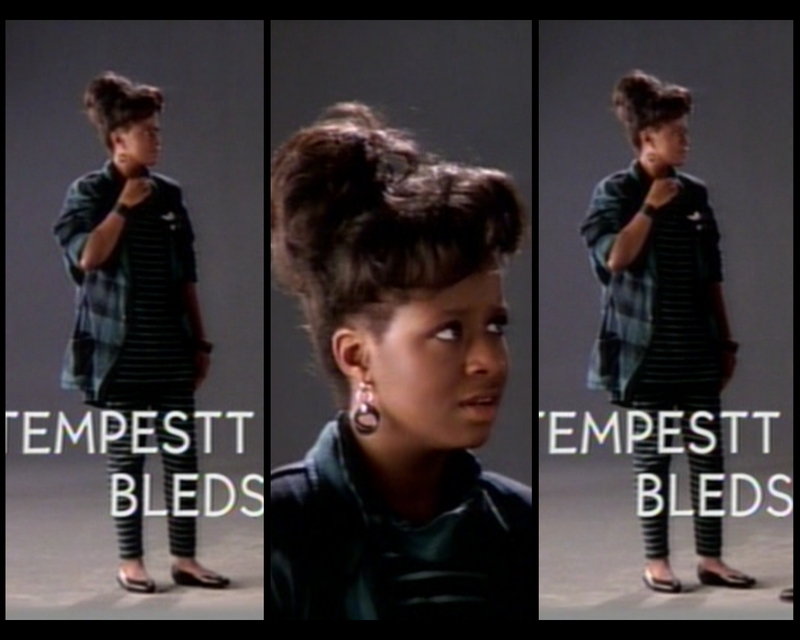 Giant shoulder pads and excessive draping are also good ways to hide a pregnancy. And wild patterns. Let's overlook all that and just appreciate the totally excessive necklace. That's a lot of look for chopping vegetables. On another note: if you're not watching the episodes as you read, I'd urge you to make an exception and see this one. 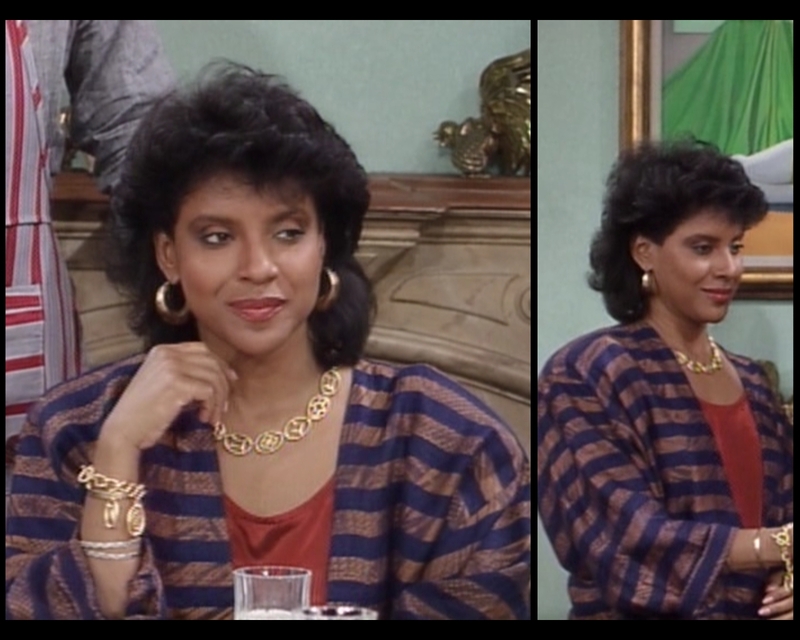 Phylicia Rashad's performance in it is phenomenal. She's wringing every last drop out of each line, and it's a joy to watch from start to finish. Her acting is always good, but she's firing on all cylinders this week and basically carries what would otherwise be a completely unremarkable episode. Go find it on Hulu+ or YouTube or something. You won't be disappointed. 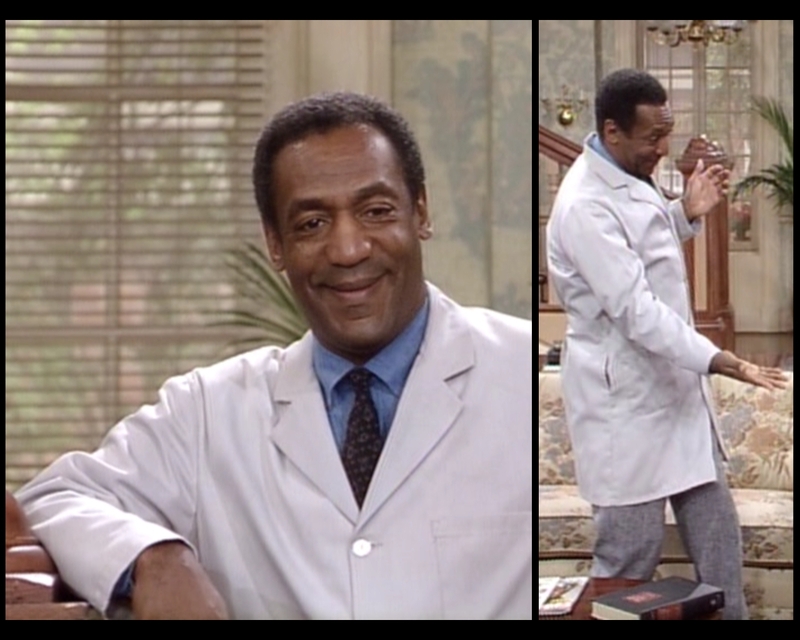 I'm going to end this week with another request for you to tweet @BillCosby with a link to my blog. Pretty please? Or just tweet about my blog to your own followers. Write about it anywhere online, really. I'm determined to become the premier source of Huxtable fashion knowledge on the internet, but I can't do that if nobody knows about this site. You're all popular and well connected, I'm sure. Help a dude out! And now I'm going to go talk to my friends about Denise's hair. 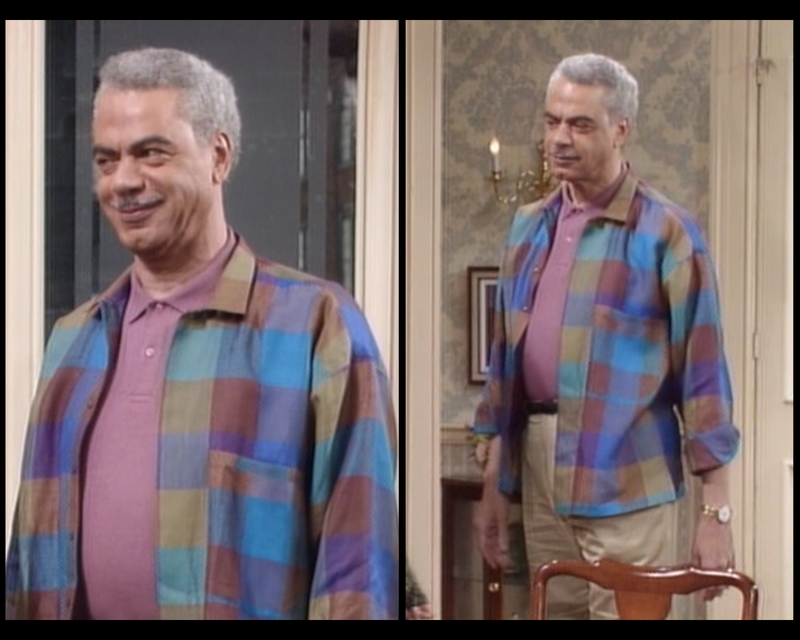 (Yes, I try unsuccessfully to engage people in conversations about sitcom fashion minutiae.) Until next week, lovelies. 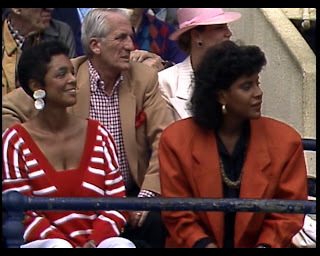 With 25 percent of the show behind us, it'a time to dive boldly into our third season with the Huxtables. 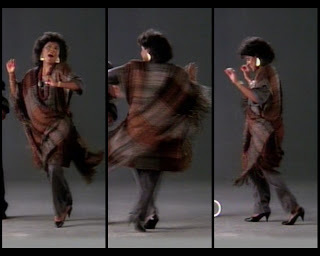 We'll begin at the beginning, looking at the choices made for the show's latest opening, which features the family dancing to a new, Latin-influenced version of the theme song. First to appear is the good doctor himself. 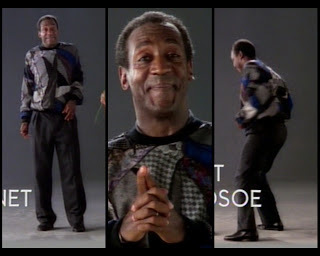 He makes it clear right from the start that he is going to hit you with some Cosby sweater in the year to come. Look at this piece of work. It's a giant mishmash of fabric shapes, and each of the smaller swatches is itself at least subtly patterned. Most of it is in the gray family, but he makes several dalliances into purple and even offers a handful of choice cobalt patches just to spice it up. The jaggedness of the overall design suggests a broken mirror almost: it is all disorder and confusion, but it's also a shining example of the fashion risk for which he was best known. 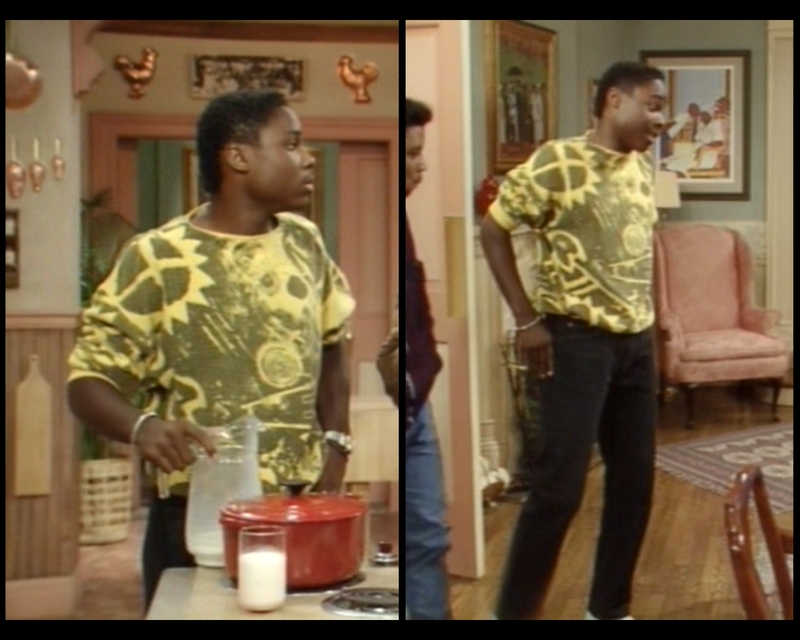 By showcasing it at the top of each episode, he makes his ownership of this style intentional. I like the choice of dark slacks and dress shoes as a base, because they suggest that he intends this as a more formal outfit. 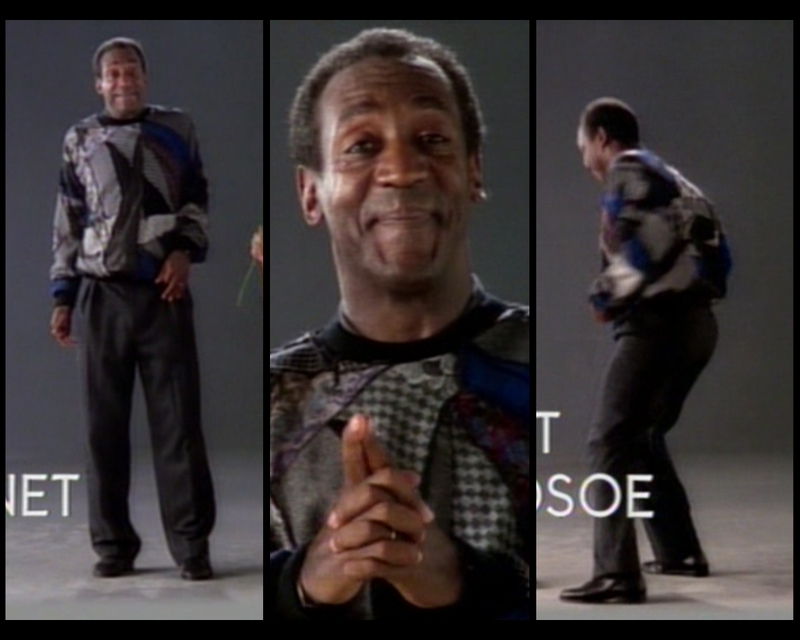 Cosby sweaters are not just for daytime. Imagine if they had just written in a sixth child. Two things change this season. 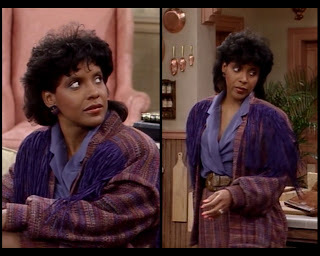 Having gotten married, the former Ms. Ayers-Allen is now officially credited as Phylicia Rashad. (It's actually Phylicia Rashād, but I'm omitting the pronunciation mark in this blog because of the hassle involved in cutting and pasting that character in every time. Sorry, I know it's lazy.) Anyhow, with her marriage came a pregnancy, so the entire season is spent trying to hide Clair's ever-expanding belly. For this sequence, she was still early enough that the carefully draped shawl masked her secret. Which is good, because this is an awesome look. It seems like it'd be too heavy to wear for actual dancing, but for an autumn stroll in the park? Divine. There's such a classic New England vibe to those charcoals and umbers; it's somewhere between Goody Putnam and Martha Stewart. But the fact that it's actually a shirt and trousers (or maybe another jumpsuit?) with a luxurious scarf draped around it turns it into this very upper class thing, which she rides out by bringing in the huge necklace and earrings. And the fringe! Darling, the fringe. Soak this up, because this is basically the only true fashion we get from her all year. Seriously, the rest of it isn't about look, it's about strategy. You'll see what I mean. She's growing on me. Slowly. Sondra will be in roughly half of the season's episodes. I have to say that, if I didn't carry a personal and completely baseless grudge against her, there's much about this outfit that I'm inclined to enjoy. 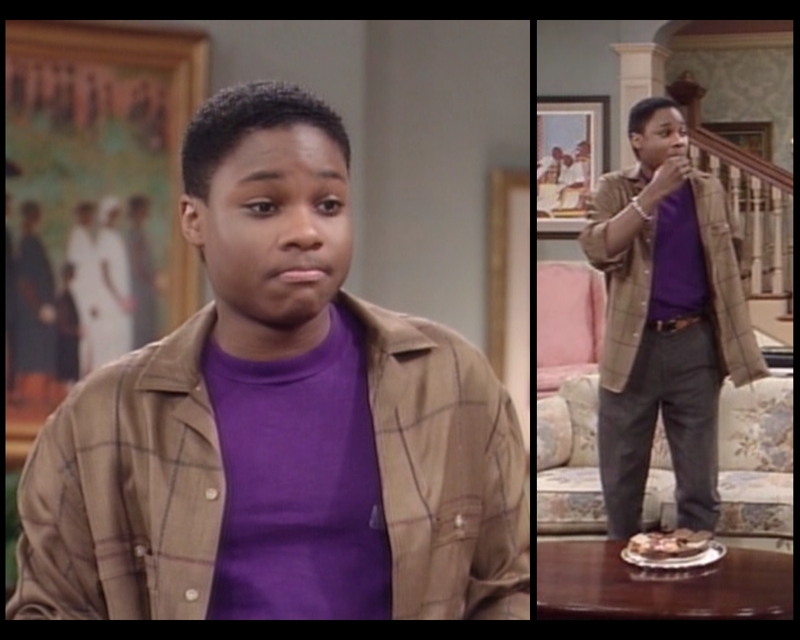 You can't deny the blazer, nor the inclination to pair that chocolate with a sort of olive shade. 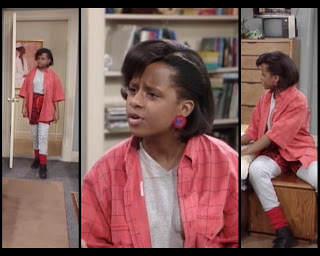 And there's a very Denise sensibility about the turtleneck top ending in pleats draping over a ruffled skirt leading into bunchy pants that are tight without quite becoming leggings. Her use of pattern and shape is experimental and compelling. She's going for something here, and I have to applaud the vision. I do think that you run the risk of looking like Kermit when you throw down this much green. She might also want to reconsider the shoes: right shade, wrong style. Still, a lot about her presentation has been polished from previous appearances. This is a more adult way of looking at Sondra. As she enters her senior year at Princeton, she's finding herself, it seems. Speaking of Denise, here she is. 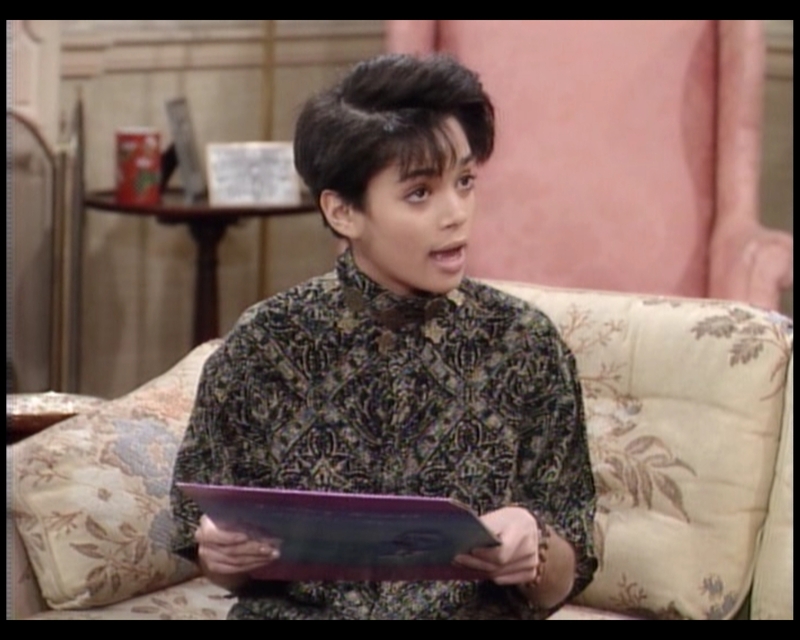 I have to say, Lisa Bonet has impressed me more and more as a comedic performer. There's a certain carefree spirit she exudes that's actually rather difficult to pull off. You'd be amazed how tricky it is to look effortless when a camera is pointed at you. But she has this loose, playful manner that I just love. 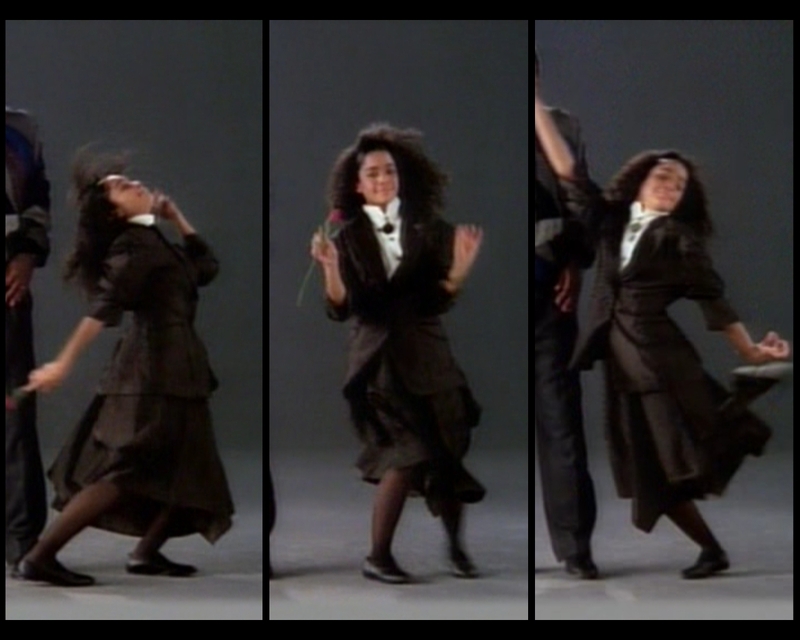 You can see it in the dance moves here. She's just goofing around. The outfit, on the other hand, is no joke. She's still dabbling in androgynous clothing; the shirt and blazer are clearly tailored for a woman, but have a masculine influence. She makes them her own by pushing the sleeves up and popping the collar. The latter is a move that I almost never allow, but it actually works here. To keep the look from slipping into silliness, however, she goes all black and all shiny. The billowy, complex skirt is extremely formal, yet kept young with its irregular, just-below-the-knee hemline. Her matching headband is an awesome way to give her hair a controlled wildness. And her shoes are flats because she's not caving to misogynistic tortures for the male gaze. That's right, Denise. You show them. But honestly, how flawless is this look? I live. 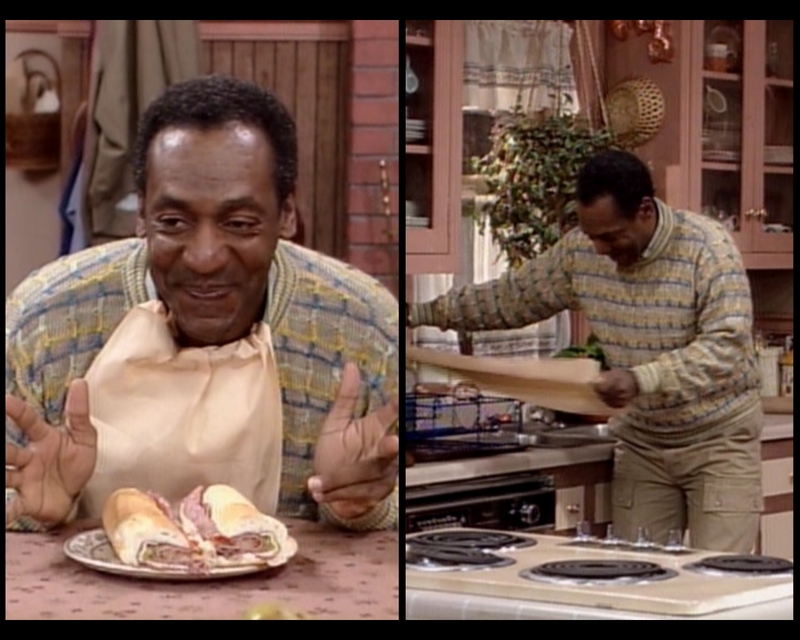 Theo busts out a Cosby impersonation, and he's not half bad at it. His look isn't anything special, though. Unlike his father, he neglects to break up the grays with a splash of color anywhere, leaving him to blend into the background. The silhouette is alright, I guess, though it's his usual approach: big on top, tight jeans on the bottom. And really these jeans aren't even that slim, but I guess we're moving toward the '90s where that cut falls out of vogue. I don't know, this doesn't really do much for me. The left and right really are two different screenshots. She just doesn't move much. Vanessa and Theo are serving similar concepts. I feel like if we could average out all of the outfits on this show, they'd end up being shaped almost exactly like a soft-serve ice cream cone. The ideal is to have a big rounded torso with legs that taper down to a point, apparently. She's also doing the Theo thing in that she's adhering to a pretty tight chromatic range. At least she's going for blues and teals instead of grays. The shades are nice on her. Looking closely, however, we can see that she's wearing either a shirt that matches her pants or a single, continuous striped onesie, and no matter which is correct, I have to question that selection. Despite that, I'm liking more about this than I dislike. 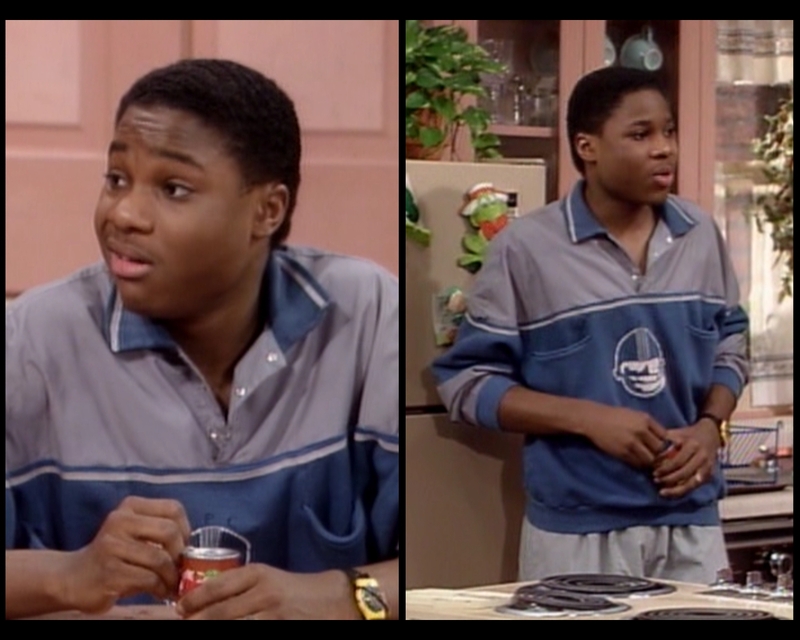 I think I've spent too long staring at all the clothes from this show. I've been Stockholm Syndromed into acceptance. This is how it happens: if you're told it looks good for a long enough time, you just begin to believe it. The braids pair with the lederhosen-y band across her chest in a manner that just screams costume. She could audition for a revival of The Sound of Music in that getup. I like the gold, though, and I love that she jumped. 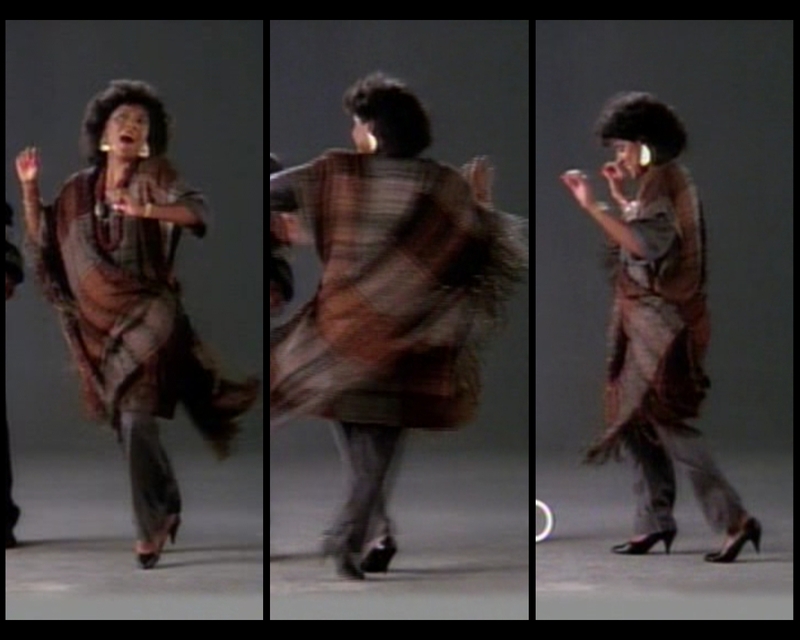 This sequence with her is the best: Bill Cosby kicks his leg over her head, and then she just hops into the air. It's the peak of all televised adorableness in 1986, I'm sure of it. And there you have it, folks. Now, usually I'd post a donation link here, but I'm going to forgo that this week. Instead, I've got a different favor to ask. Do you use Twitter? If so, would you mind tweeting at Mr. Cosby with a link to this blog? 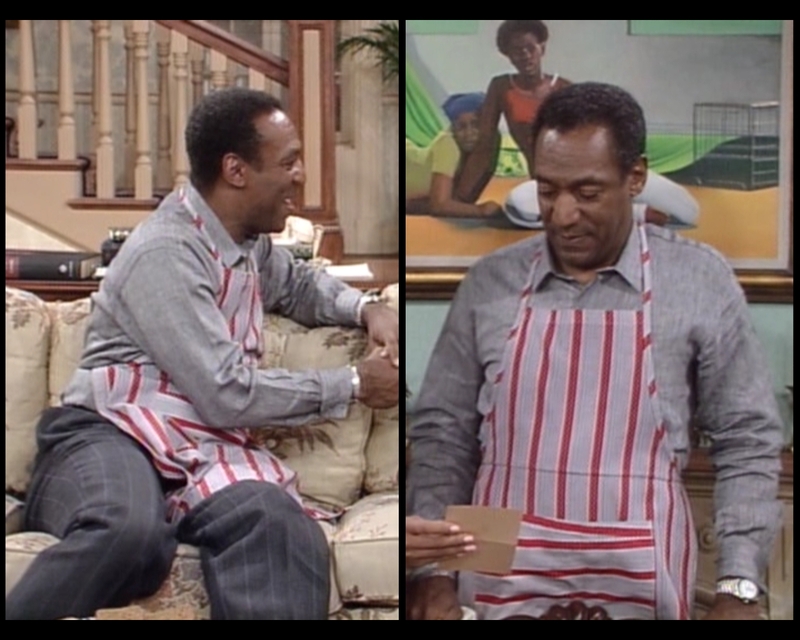 Let @BillCosby know that you love this project, and that you think he might, too. I'm hoping he'll respond to what I've done so far. Ideally, his response will not be a cease and desist letter. To end the season, the family gathers as Denise announces which college she will attend in the fall. She seems to have gotten into numerous schools, given that she begins the day having already "narrowed" the field to five possibilities. By the afternoon, it's between NYU and Hillman. I personally would have gone with NYU, since it actually exists, but then I wouldn't have positioned myself particularly well for my own spin-off sitcom. Way to think ahead, Denise. But that's not coming for another year; despite her enrollment at Hillman, Denise will only miss eight episodes next season. But we'll get there when we get there. Let's deal with today first. He's working the knowing grin pretty hard. Russell and Anna come over to help Denise make a choice, though of course they're deeply biased. I'm constantly convinced that I've already reviewed clothes that I have not, in fact, reviewed. This project is turning my brain into a ball of fabric remnants. 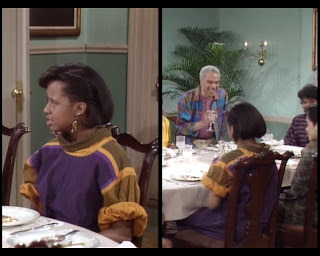 Anyhow, this until-now unseen pastel number (watch, one of you is going to find it in a previous episode) is fabulous in terms of its use of multiple blocks of color. It immediately draws the eye, not because it is an affront but because it is a joy to behold. On the pale mauve base set by that polo, it manages to look practically serene despite the complexity of the color scheme. I love this outfit for him. My one complaint is that the fit of the baggy shirt over the tight shirt makes him look rather paunchy around the middle. Grandpa generally flatters his form a little more than this. Something about the belt placement and draping just aren't working. And while we're talking belt, I'd have gone with a brown. Everything else is so soft, don't jolt my retina with that bolt of black. Her facial expressions in this episode get pretty manically deranged. Anna's a lot of fun. She's pulled a few weird moves on us. I think Denise might get some of her eye for style from her grandmother. This dress has a strange, bunchy thing happening at the bottom that I'm not necessarily adoring, but not outright hating. Though not particularly elegant or flattering, the shape is compelling. It's chunky and rectangular in its cut, not to mention the short, oddly split sleeves or the puff of pleating at her shins... I don't know, she's going somewhere new and I feel inclined to follow her. I'm happiest with the high neckline accented by the off-center scarf. It softens the jump from that forceful yellow into her neutral skin tone. She's done a good job: if you're going to get dressed up, go ahead and get dressed up, right? I'm counting Sondra in with the guest stars since she's never here. It will shock no one that I dislike this outfit. We'll get to that jacket, which is obviously the heart of the problem, but let's start with the lower layers. For the time, the basic jeans with a t-shirt under a tank top wouldn't have been a terrible choice. The colors are fine, though not particularly noteworthy for any reason, and as far as I can tell, everything fits. Her hair, on the other hand, is desperate for a brush or a bottle of conditioner or really anything to make it look less gnarly. I can't even bring myself to do more than acknowledge the single earring in passing. And now, the coat. 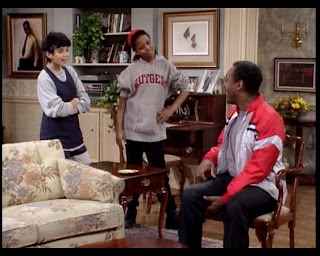 The Huxtable women, it seems, are trophy keepers. 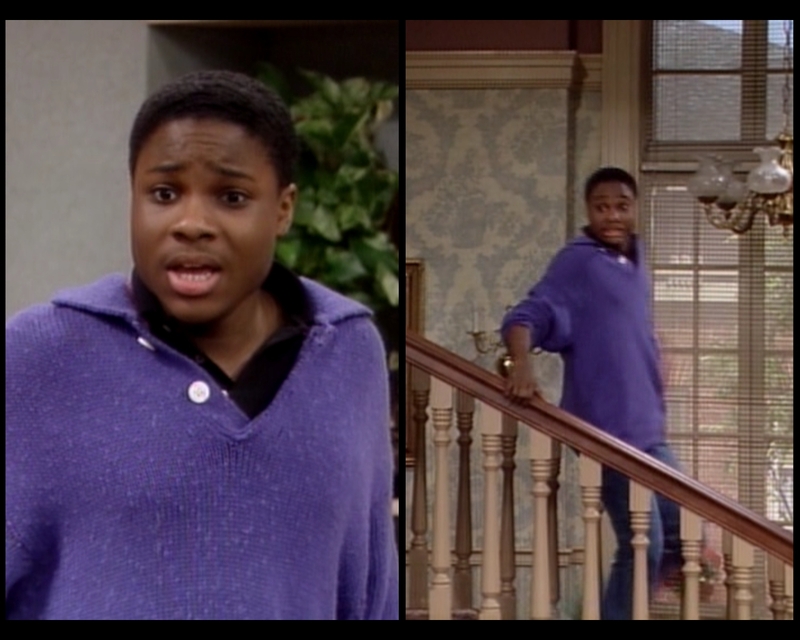 Denise took her boyfriend's scarf, Clair frequently "borrows" Cliff's cardigan, and now Denise has claimed the blazer that Daryl wore in episode #2.4. Given how large he is in comparison to her, it's no wonder that this gives her a positively comical silhouette. Look at her as she bounds through the door like the god damned Kool-Aid Man. The rolled-up sleeves actually work, but come on, this garment was created for someone whose body bears no resemblance to hers. It was especially wrong of her to steal this when we account for how much better he wore it. Photo credit unavailable. Please don't sue me! See? Also, that's what a well-tailored blazer looks like, FYI. Don't be sad, Rudy. 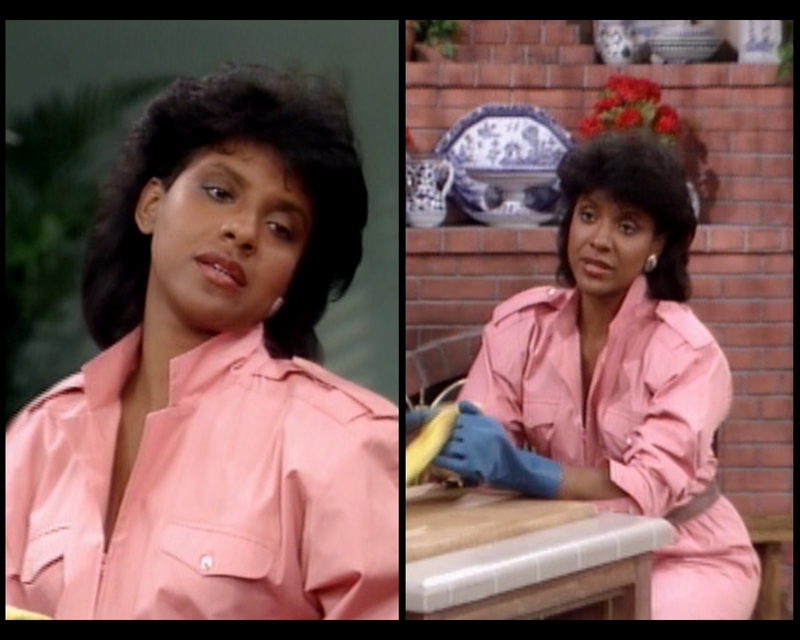 The all-denim look had a brief comeback at the turn of the century. Seriously, Justin Timberlake made it OK to leave the house in a suit made of jeans for, like, a whole year. Also, yellow looks great on you. She's a superhero imbued with epic amounts of laziness. I want to cut Vanessa some slack because this is probably just a lounging-around-the-house look, but she's put so much effort into the matching-ish layers that I have to spend at least some time commenting on them. I mean, it goes without saying that this is awful. She's, oddly, closer to the current red and pink trend than her older sister, but still miles away from anything that could be considered fashionable. I mean, she's wearing clothes over a sweatsuit. No. No absolutely not never no. And why have those shorts been hiked up so high? They are literally touching the bottom of her rib cage. There's a manic, unmedicated part of me that almost thinks you could take just the pink shirt and the high-waisted shorts and make a sort of funky, so-bad-it's-good-but-still-a-little-bad outfit, but mostly I think this is an unsalvageable disaster. And I'm tired of those earrings. Her hair at least looks nice. Like Sondra, she chooses to change before dinner. Unlike Sondra, she comes to the table wearing a rejected ewok costume prototype. No, for real, what am I looking at? The marigold, eggplant, and olive are pukey, the geometric patterning is retro without the fun, and the rolled collar and cuffs take a supposedly formal garment back into the realm of the casual. Any attempt at elegance is totally undercut by the junky palette and confusing fit. This is deplorable. There's definitely the start of a pectoral situation here. Theo sticks with a single look this time. Though the top half is a repeat of his episode #2.12 "dressy" outfit, I much prefer it this time around. Rather than trying to make it cleaner than it is, he leaves it unbuttoned and aims for easygoing. The gray pants are fine, but the tan belt sticks out in a terrible way. Denise is rocking a rad silhouette this week, pairing a fitted (for her, at least) top with some great big gaucho pants and high boots. This is actually a retro look for her; gauchos had fallen out of fashion by the end of the '70s, so she's not doing something brand new, but rather trying to push a comeback. Somehow that knowledge makes this a little more compelling to me. Wearing clothes that were popular a decade ago often makes you look really tragic to others. Imagine walking around today in the aforementioned all-denim Justin Timberlake ensemble. It'd come across like a joke. In that context, this is a completely renegade move. 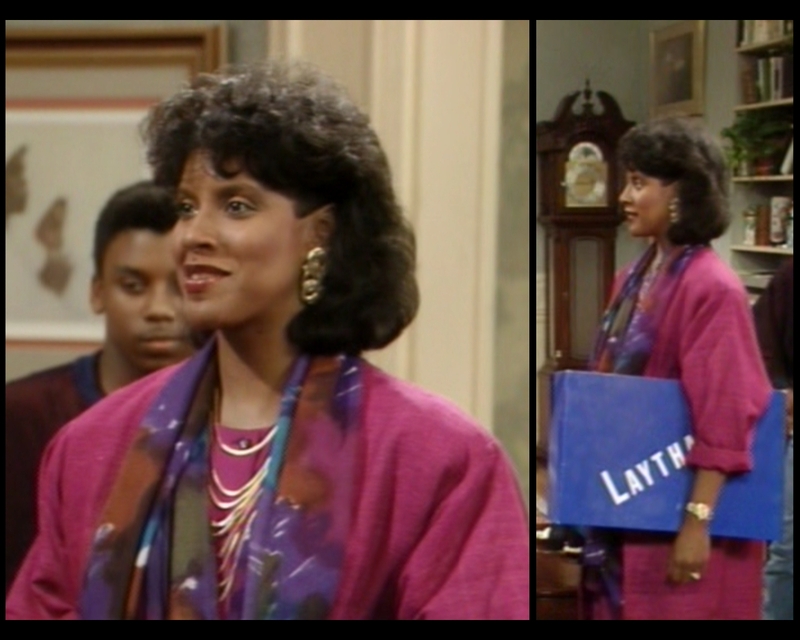 The episode starts with Clair listening to a Jimmy Scott album because she's awesome. Up close, that blouse is a phenomenon. The pattern? Opulence. The colors? Regal. The neckline? Superb. The necklace worn over the blouse? Flawless. She should have applied to FIT. Yes, she's awesome even if she wears this. Clair sort of lets me down with this first display. I'm not sure what's going on beneath that pumpkin-colored monster, but it seems to be a jumpsuit patterned in autumnal shades and belted well above her pelvis. I love the hues, but she's presenting a little like a low-budget supervillain. I'm tempted to say that it would be better without that shirty jackety whatever fabric humongoid thing, but we don't know for sure what lurks beneath, so I'll keep my guesses to myself. This I can get behind. The red shiny top I actually don't care about at all, but I guess she needed a neutral-ish base, and everything else here just sings. The subtly patterned royal blue and gold in horizontal stripes, under all that round jewelry? Heavens yes. She shows her daughters how draping is done this time around, using the bulk of her blouse to give off a high-fashion, queenly air rather than just slouching into the billows of cloth. I wish we could see what sort of pants she's wearing. In my head, they are so slimly, perfectly tailored that your heart breaks. I know that in real life they're probably a pleated mess in a clashing color, but we thankfully never have to see her brilliant top half tarnished in such a manner. 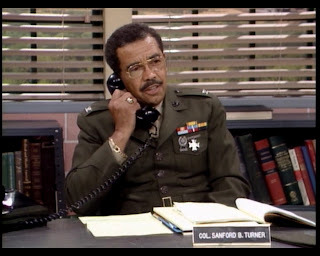 It's a shame to end on Cliff, really, as he has so little to offer this episode. Lab coat over boring business casual? Who wants to talk about that? 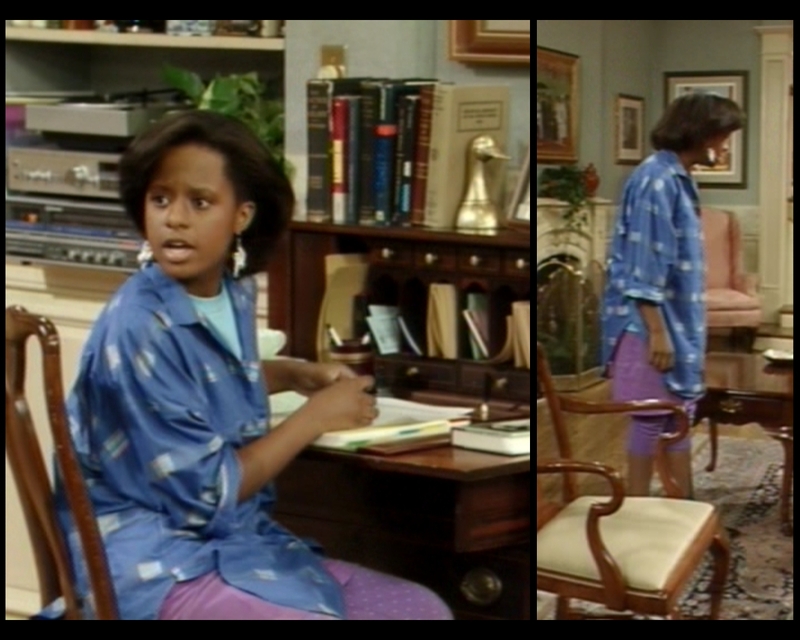 The paintings in the Huxtable household are wild. 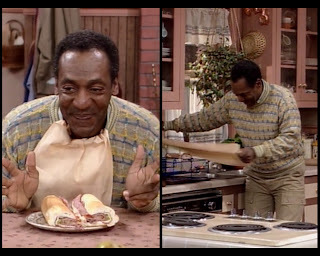 After losing a bet to Clair, Cliff has to serve dinner to the whole family. Unfortunately, this means that he has to spend the entire second half of the episode behind this apron. Not that we're missing much: it's all gray. The pin-striped pants are nice, I guess. I'm not a huge fan of the shirt, but I think it's well chosen. After all, when Denise had the opportunity to dress him in episode #1.9, this is the top she chose. 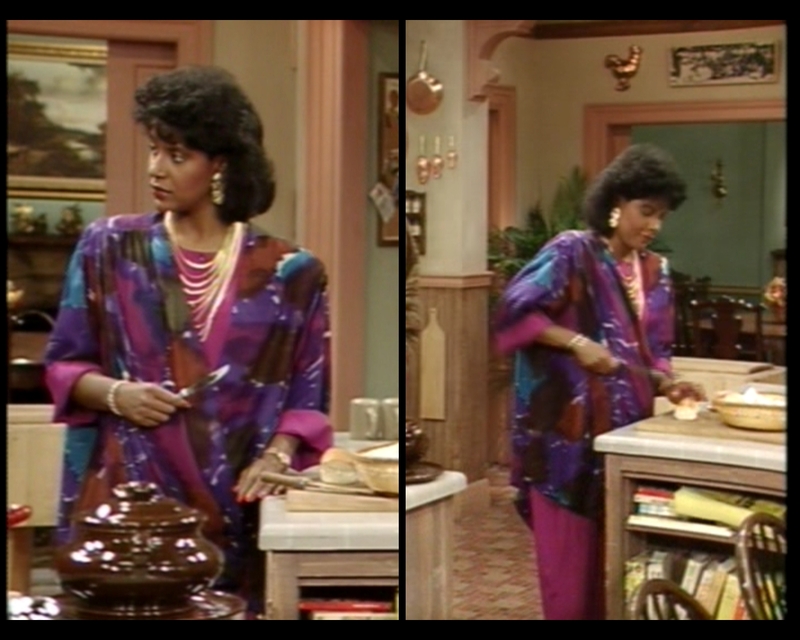 Thus, there's a slight poignancy to his decision to wear her favorite piece from his closet. I'm not sure if the costume department realized they were doing that, but I certainly hope so. And there we have it: two whole seasons of Huxtable fashion. Can you believe it? I can't. I hope you've enjoyed reading along with me as much as I've enjoyed writing this for you. If this blog has kept you amused enough that you'd like to provide a little financial support, then I would of course be grateful. A dollar here and there helps me pay for the basics to keep this site running, and to prepare for future improvements. If you'd like to send me a buck through the magic of the internet, then the yellow button below will help you out. If you want to provide non-monetary assistance, then the best thing you can do for me is to direct traffic my way. Anything you can do to get me an audience would be hugely appreciated. Of course, if you'd prefer not to send money or share my URL with others, I'll still keep writing. I said I would finish all eight seasons, and that's just what I intend to do. See you next week, when we take our first peek at season three!